Greenpeace activists took their battle against Shell's plans to drill in the Arctic to a new level this morning with a daring counter-advertising campaign as bemused commuters looked on. 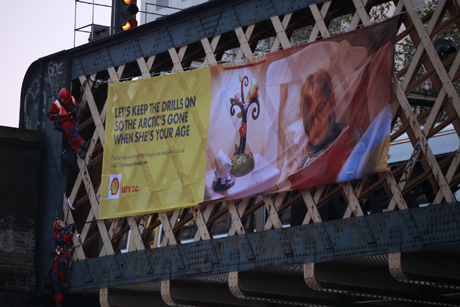 The morning’s action was a response to Shell’s latest billboard ad that portrays a girl reading a book in bed by lamp light, and carries the caption: "Let’s keep the lights on when she’s your age." Shortly before dawn this morning, a team of ten Greenpeace activists, including four experienced climbers, scaled the outside of a railway bridge on York Road, near Waterloo Station, opposite Shell’s central London offices. 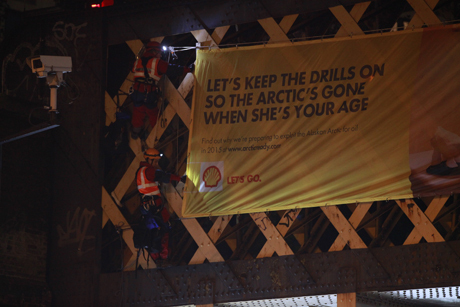 Once in place, the activists unfurled a billboard poster that satirises the style of Shell’s ad with the caption: "Let’s keep the drills on, so the Arctic’s gone when she’s your age." At least two activists intend to remain attached to the walls of the bridge with ropes until lunchtime to ensure the billboard is seen by the maximum number of people, including Shell staff. British Transport Police has arrived on the scene and intends to send in its own climbers to talk to the activists about safety but it is thought they will not interfere with the billboard. In addition to the guerrilla-billboard, Greenpeace has also taken out counter-adverts in Metro, The Independent and The Daily Telegraph today with the headline "Shell’s Arctic drilling plans are the stuff of nightmares". More than 2,300 Greenpeace supporters donated money to pay for the newspaper adverts. Greenpeace estimates that Shell has spent £280,000 on billboards and newspaper adverts for its latest campaign, which it denounced as appalling hypocrisy. Shell’s ad even features a polar bear toy on the girl’s bedside table in its ad, which enraged the environmental group even further. Sara Ayech, Arctic campaigner at Greenpeace, said: "We were inundated with calls from our supporters who were appalled by the hypocrisy in Shell’s latest ads. Shell just got dumped by Lego for threatening to drill in the Arctic, but it’s back using kids once more to try to clean up its public image. Far from safeguarding kids’ future, its Arctic drilling plans risk polluting a pristine region and exacerbating climate change. And now Shell is even including polar bears in its adverts, despite the fact drilling for oil in the Arctic would threaten this unique species." The counter-advertising campaign is the latest salvo in an ongoing battle Greenpeace is waging against Shell, after the oil company submitted plans to US authorities in August for drilling in the Arctic. The environmental campaigners successfully carried out a brand attack campaign against Lego during the summer that saw the toy company pledge to end a long-term partnership with Shell. Shell said in a statement that it was working towards developing a solution to the global energy challenge and trying to ensure a lower-carbon future. A Shell spokesman said: "It is disappointing that Greenpeace chooses to focus on mounting publicity stunts rather than engage constructively in the debate about how to meet the world’s growing demand for energy while reducing CO2 emissions." When does a brand partnership become a toxic relationship?